Download the Walkabout Language Learning Action Guide. It contains step by step instructions to help you create your own language learning program. Check out Owen Lee's Ultimate Language Secrets; packed with ideas, it is a great supplement to Walkabout Language Learning. 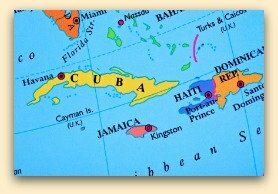 Most recently, Terry and Ann journeyed to Cuba. Read their Cuba blog below to learn more about what they experienced there. Would you like to learn more about how to create your own successful blog like this one? Maybe you have great travel stories to share, or a passion like we have for language learning. We learned the techniques to build this website that gets traffic, makes money, AND lets us share our passion with people like you. You can too. For fifty years, it was illegal for Americans to visit Cuba. But in recent years, the laws have been softened--slightly. It is still difficult for Americans to visit Cuba. The law in the United States only allows visitors that meet certain requirements: humanitarian projects, students, religious visitors. Terry and Ann visited Cuba in 2012 as part of a humanitarian mission to Cuba. They and their fellow travelers brought medical supplies to Jewish clinics in Cuba. 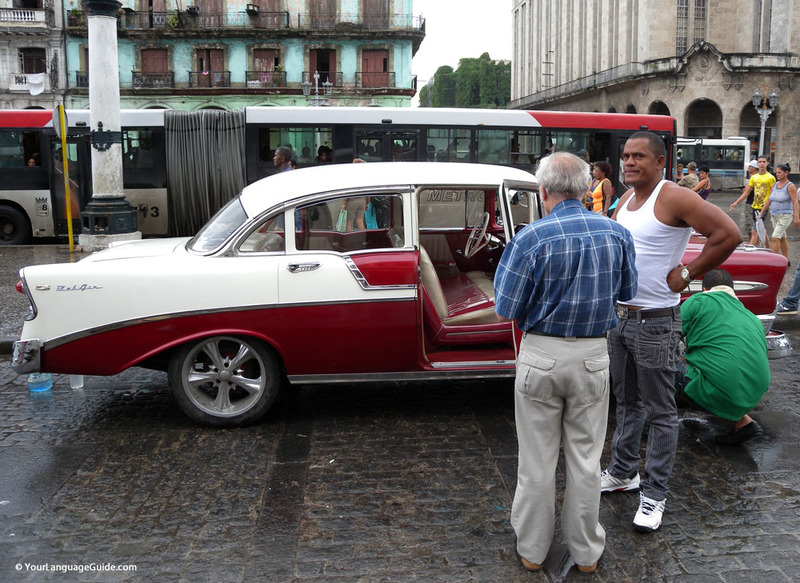 Life in Cuba today: 52 yeas of progress? It's been 53 years since the Cuban revolution and Fidel's, and now, Raul Castro's rule. Are the Cubans who stayed better off than they were in 1958? Has their brand of socialism succeeded? Read about life in Cuba. Today, Jewish Havana is thriving. 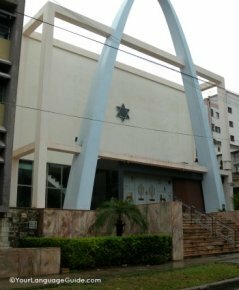 Come with us as we visit Havana’s three synagogues, talk to its leaders, and get a glimpse into both its history and its future. Cuba at last! I’ve waited 52 years for this trip. We’re an hour out of Miami, our propeller-driven plane shivering and shaking its way through the rain. The clouds break. Cuba stretches below, velvety green. I’m barely out of the van when a guy waves me over to a gorgeously restored Chevy: a ‘56 Bel Air sports sedan. “I give you a ride, señor!” He tries to push me inside. He’s in my face; I scurry away. Read the whole Cuban blog. It starts with our rainy flight from Miami to Cuba where we are greeted by rows of Cuban classic cars. We visit Jewish synagogues, meet Cuban people, search for Che Guevara, stay in fancy hotels, sit with John Lennon, and ponder on the effect of the US Cuban embargo. Ann and Terry have been working on their Spanish for forty years or so. 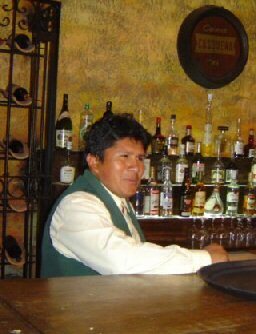 Terry developed a loved for Spanish speaking people in his small home town in Southern Colorado. Later, after college, he and Ann worked at the Head Start. Most of the children in the program where children of Hispanic immigrants. Their first trip to Cuernavaca Mexico in 1973 let them practice the language full time, and they developed an unquenchable thirst for it. 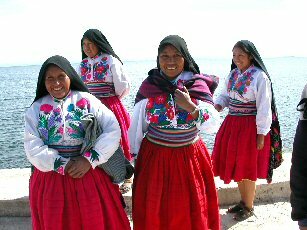 They traveled to Cusco, Peru in 2007 for a four week intensive Spanish program. Read about their adventures. 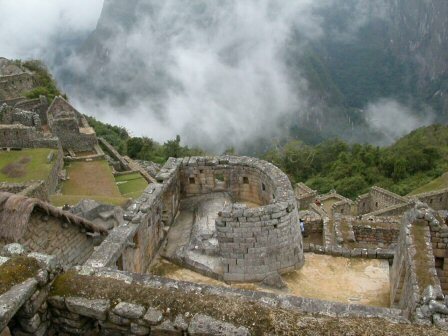 When you hear the words Cusco or Peru, Machu Picchu immediately comes to mind. Words can't convey the enormity of what the Incas built. Imagine me trolling Cusco bars in search of a UFC Ultimate Fighting Championship bout. Can't imagine it? Me, either, but using personal hobbies is one of our best foreign language learning tips. This is ecotourism travel at its most engaging: we're sipping quinoa-laced potato soup by candlelight at Juan Quispe's. We're huddled around a tiny table in his dirt-floored kitchen on Amantani Island in Titicaca Lake. Peru housing is one of many bright spots in our trip. 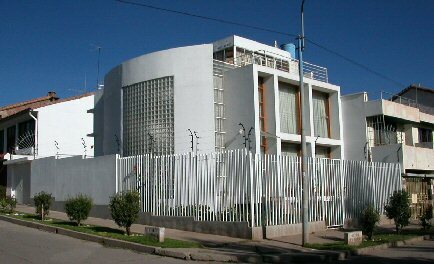 Maximo Nivel provided for great accommodation, matching us with a Cusco host family that keeps students regularly. Diner hour provides a daily community language learning experience. Although, these four are our most popular pages, there are lots of great language learning tips and in the rest of our Peru pages. You can read how we handled getting sick, and learn about the many sights that we saw while in Peru, as well at the one that we wished we saw. Would you believe: Altitude Sickness!? In 2003, Leslie's employer sent her to India to help launch a new business account in Gurgaon, a suburb of New Delhi. Although, she was there on business, she also spent some time studying Hindi. 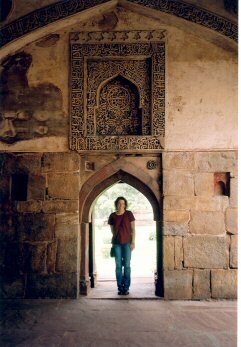 Most of all, she was fascinated by India's culture and how different it was from her own. At Walkabout Language Learning, we believe that understanding culture opens the door to better understanding language, and that learning language helps us better understand culture. 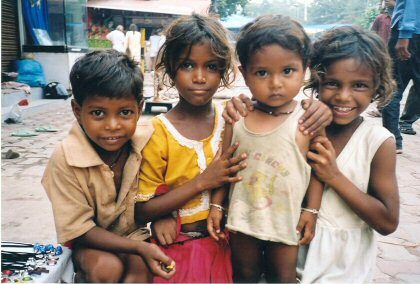 There is a large homeless population in India. People's entire lives are going on right beside the road. One homeless clan, sleeps on cots parallel parked along the street under the light of a bright street lamp. Holy Cow, What Happens when One Dies? 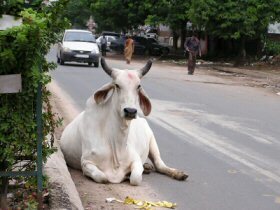 What happens when one of the street cows die? Does someone remove the corpse? Little did I realize that I would have the opportunity to find out so quickly. Call Centers in India: Am I Talking to Myself? I called American Express. I suspected that my call had been routed to one of the call centers in India because the customer service agent sounded Indian. I went shopping at the market today. That was fun. 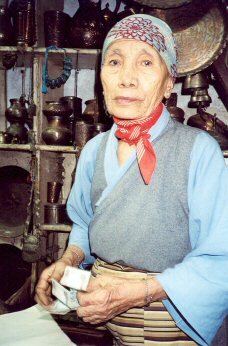 Versha, the proprietress of the guest house, took me so that she could do the bargaining. Read the whole series of reflections on India and Indian culture. Learn about traffic in India, eat street food, explore Indian clothing, music and food, and reflect with Leslie about what they do with all those cows that wander around the streets. Also, she how she used this business trip to learn a little bit of the local language. Call Centers in India: Am I Talking to … Myself? Poverty in India: A little TV Tonight? Your Tarp or Mine?